West Indies team celebrate winning the second Test and winning 2-0 lead in series. 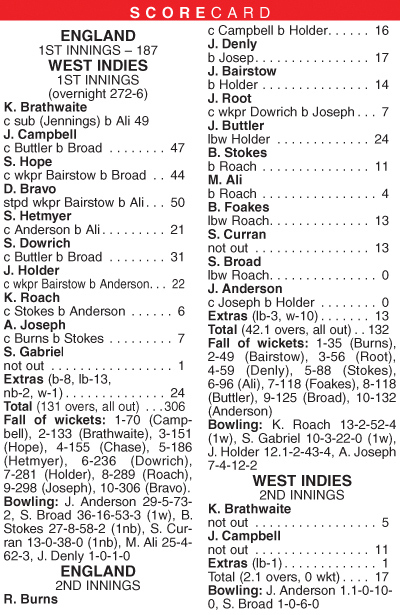 ANTIGUA AND BARBUDA, Saturday - Kemar Roach and captain Jason Holder led another rout of the England batting line-up as the West Indies completed a crushing series-clinching 10-wicket victory after tea on the third day of the second Test at the Sir Vivian Richards Stadium in Antigua on Saturday. A dejected England captain Joe Root said: “It’s been frustrating. I think we’ve been outperformed once again and that’s quite hard to take. Roach, who earned the “Man of the Match” award, then took over in tandem with Holder after tea, triggering England’s final slide to humiliation by bowling Ben Stokes off the inside-edge as six wickets tumbled for 44 runs, Joseph taking a diving, sprawling catch at mid-on off his captain to dismiss Anderson and end another abject batting display by a team ranked number three in Tests. Most of the focus at the start of the day was on Bravo, the lone West Indies batsman to fail in both innings of the first Test. He made amends in a manner completely against his nature, his even 50 coming off 216 deliveries, the slowest-ever by a West Indies batsman in Test cricket in terms of balls faced.